Updated for the 2018 Tax Cuts and Jobs Act! Advanced Tax Tactics has been fully updated to teach you how to take advantage of the new Trump tax laws. Two of the best tutors in the area of taxes and asset protection bring the tax laws down to earth so you get the practical instruction on how to use them. Not only do you get more money, you cut your audit risk substantially. Former IRS Special Auditor Ben Rucker joins attorney Lee Phillips to give you the inside scoop on how to save on your taxes by proactively setting yourself up for success. Using these legal tools will enable you to keep more of the money you make. The IRS is a major impediment both to keeping or growing what you have been able to make. Use the correct structure to minimize the IRS tax effects and you’ll have a lot more money to work with year after year well into the future. Most tax tips on the net or in print don’t apply to the average tax payer or even the small business folks and professionals. The tax tips you’ll get here have been carefully developed for successful business people, professionals, real estate investors, or any other American tax payer. Proactively set yourself up for success by using these legal tools to keep more of the money you make. These materials are available as an instant download delivered via email. We also offer a physical version consisting of audio CDs and a hard copy manual for an additional printing fee of $25. It includes the instant download for you to start on while waiting for the physical version to be shipped. There’s a problem if you can’t cut your tax bill by 20% after using the Advanced Tax Tactics. It’s fully updated for the new Trump tax laws. It gives you solid black-letter tactics that you can use to cut your adjusted gross income. It leads you through what you need to do to put your AGI on a diet. Your CPA just plugs in the numbers you give him. You’ve got to live life every day so you can “create” the numbers your CPA uses, and Advanced Tax Tactics shows you step by step what to do. 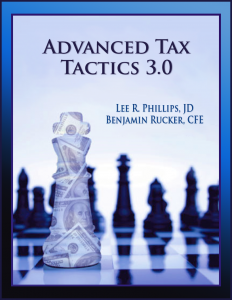 The three hours of audio instruction in the Advanced Tax Tactics will return you thousands, of not tens of thousands, of dollars in tax savings for every hour you spend. Could you spend three hours to make an extra ten thousand this year? You can’t work any harder, but the Advanced Tax Tactics can get you a lot more money to spend. The IRS is a major impediment to financial success and security. Combine the law and the IRS loopholes and you’ve got success and security. The Advanced Tax Tactics will work for you year after year to make you more money and give you more security.both to keeping or growing what you have been able to make. Use the correct structure to minimize the IRS tax effects and you’ll have a lot more money to work with year after year well into the future. Lee Phillips is a United States Supreme Court Counselor who has helped over a half million people understand how to use the law to make more money and protect their assets. He has practiced law for over 30 years and helped some of the wealthiest people in the US and Canada protect themselves. Ben Rucker is an accountant with a Masters in Tax who spent 7 years as an IRS Special Enforcement Auditor. He is a certified fraud examiner. His tax planning strategies often result in substantial tax savings and reduced audit risk through legal and ethical strategies. He helps reduce your legal risk and pay less in taxes by teaching you to implement the best tax structure, keep correct books and records, and get time your income so that it will be taxed at a lower rate.